Arab League tells Brazil’s President-elect that moving embassy to Jerusalem would be a setback for relations with Arab countries. The Arab League has told Brazil’s President-elect Jair Bolsonaro that moving his country’s embassy in Israel to Jerusalem would be a setback for relations with Arab countries, Reuters reported Monday, citing a letter sent by the Arab League to Bolsonaro. The letter to Bolsonaro from the league’s Secretary General Ahmed Aboul Gheit and delivered to Brazil’s foreign ministry said the decision on where to locate an embassy was the sovereign decision of any country. “However, the situation of Israel is not normal, seeing that it is a country that has been occupying Palestinian territories by force - among them East Jerusalem,” the letter said, according to Reuters. Moving the embassy to Jerusalem would be considered a violation of international law and the United National Security Council resolutions, Aboul Gheit said. “The Arab world has much respect for Brazil and we want not just to maintain relations but improve and diversify them. But the intention of moving the embassy to Jerusalem could harm them,” the diplomat said. 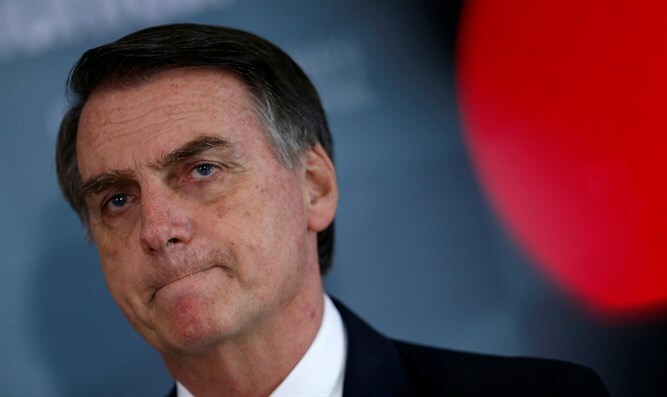 Reuters published the contents of the letter hours after a television report in Israel said that Bolsonaro had told US National Security Adviser John Bolton that no final decision had yet been made on the relocation of Brazil’s embassy. Brazil is one of the world’s top halal meat exporters and that trade could run into trouble if Bolsonaro angers Arab nations by moving the embassy, noted Reuters. That could hurt exports to key Middle Eastern markets for Brazilian beef and poultry producers BRF SA and JBS SA. Bolsonaro’s son, Eduardo, recently met with US President Donald Trump's son-in-law and adviser Jared Kushner.